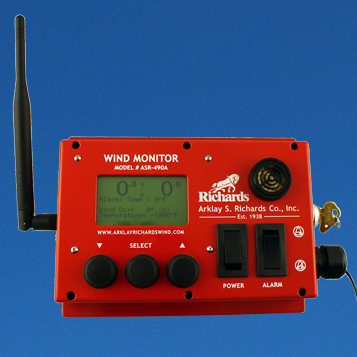 Arklay Richards manufactures hard wired and wireless wind speed alarms in addition to wind speed displays. These alarms alert and measure high speed wind gusts in the unit of your choice. Select mph, meters per second (m/s), or kilometers per hour (kph). Single pole double throw alarms activate when the wind velocity exceeds the set point. Alarms can be set in one of four time delay modes. The Richards 490-A wind monitor alarm can display current wind speed, direction, and temperature. 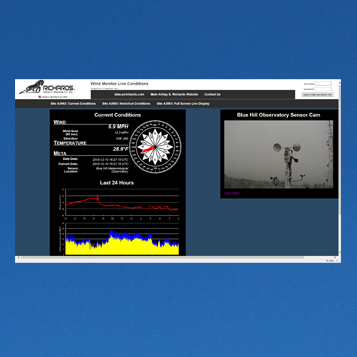 The Richards 490-A Wind Monitor / Alarm is an industrial wind instrument to display the current wind speed, maximum wind gust speed registered during the previous 60 seconds, and the current wind direction. C5 and C5C Series Cup Anemometers and D5 and D5C Series Wind Vanes can be hard wired to the monitor. The instrument also has the capability to display temperature together with a resistance type temperature probe (not included). The 490-A Wind Monitor has a menu-driven interface using the LCD and three front panel selection buttons to make set up very easy. User setup options include unit of measurement, sensor type as well as gust speed. There is also a wind speed setting for the alarm buzzer and relay. A lockout key secures any user configured settings. 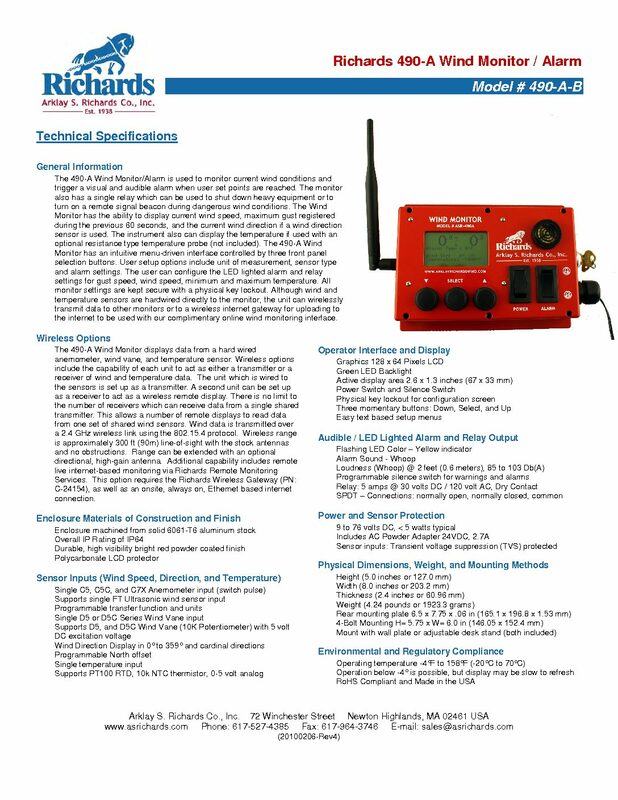 The 490-A wind monitor can be used as a either a wireless transmitter or receiver. If one unit is set up as a transmitter, then a second unit can be set up as a receiver to act as a remote display. A 802.15.4 protocol transmits wind data over a 2.4 GHz wireless link. The Wireless range is approximately 300 ft (90m) line-of-sight with the stock antennas and no obstructions. Additionally, an optional directional, high-gain antenna can extend the range. Furthermore, the monitor includes remote live internet-based wind data monitoring via Richards Remote Monitoring Services. This option requires the Richards Wireless Gateway (PN: C-24154), together with an onsite, always on, Ethernet based internet connection. Harbor container and large gantry cranes frequently use the Richards 490-A Wind Speed Alarm. Operators rely on the alarm to quickly shut down equipment during high wind speeds. Bulk material handling and processing operations also count on the Richards 490-A Wind Alarm. Operators use the alarm to insure that product is only moves when the wind speed is below regulated levels. Call one of our sales engineers to learn more about our wind speed alarms and to help with your application. Displays wind speed, maximum gust, wind direction, and temperature. Key Lockout to secure user configured settings. Wind and temperature alarm with relay. Flush wall or panel mount. High visibility red powder coated housing. Compatible with Richards Online Wind Monitoring Web Interface (C-24154 Wireless Internet Gateway Required).